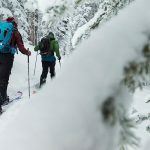 The 2/8 is ostensibly an 80-percent backcountry boot, but we felt it's talents were best realized charging around a resort and nearby sidecountry. The rockered sole and ergonomic walk mode excel in bootpacking to harder-to-reach sidecountry stashes, and the boot still has the chops to kill the line in view of the après patio. 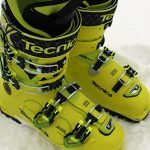 Because the 2/8 isn't quite as stiff as a Scarpa Hurricane Pro or Lange XT130, tech fittings would have given this boot a serious boost in tourability—and overall value. When the first iterations of the Dalbello AT boots (Virus series) hit the market, they turned heads in a big way. The simple, three buckle, split tongue design was performance-oriented, but had serious feel-good ergonomics to go with it. The new Sherpa series is just another step in the right direction. Dalbello has kept their three buckle system: one mid-foot buckle that holds down the metatarsals, one heel retention to lock the ankle into position, and one upper cuff to maintain the shin snugly, and no powerstrap. The minimalist design has worked well. Because the boot has a deft walk mode, I craved tech fittings. For some reason Dalbello put them on their 5/5 and 7/3 Sherpa versions, but left them off the 2/8. Big bummer. Aside from that missed opportunity, the 2/8 had everything a reputable freeride boot needs: rockered, lug sole, ergonomic walk mode, performance liner and cuff flex—at just 8lbs. With solid lateral cuff control, the boots leveraged skis back and forth on hard pack with precision. The overall boot interface from the top of my shin through the ankle was steadfast, comfy and responsive. Leaving the piste for broken snow, the boot maintained its stability during medium-radius turns as well as shorter, hoppier maneuvers in tighter terrain. Still, I felt the forward lean was a little upright for my style; others may disagree, of course. The overlap Intuition liner helped stiffen the overall longitudinal flex of the boot. It definitely aligned the 2/8 with other freeride-specifically branded boots, more so than their AT brethren, which I experienced driving a pair of 188 Rossi Super 7s through the crud and broken powder. For the record, the fraction in the name equates to Resort/Downhill. 2/8 favors downhill performance; the 5/5 is the balance between downhill and walkability; 7/3 is fast and light, with emphasis on superior tourability.